This delicious side dish is full of caramelized flavor punctuated by tasty bits of bacon and crispy goodness. Pair this dish with pork chops or roasted chicken for a wonderful, low-carb meal. In a large bowl, combine Brussels sprouts and olive oil and toss to coat. Season with salt and freshly ground black pepper, to taste. 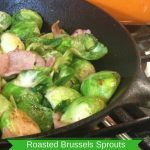 Did you like “Pan-Roasted Brussels Sprouts With Bacon Recipe”? We would greatly appreciate if you share this on your favorite social media.